Turkey glazed with a Southwestern-style barbecue sauce flavored with coffee and cumin. Combine barbecue sauce, corn syrup, coffee and cumin in glass measuring cup. Microwave on high 1 minute, stirring once, or until coffee is dissolved. Add butter; stir until melted. Set glaze aside to cool. Remove neck and giblets from body and neck cavities of turkey; refrigerate for another use or discard. Drain juices from turkey; pat dry with paper towels. Turn wings back to hold neck skin against back of turkey. Place turkey, breast up, on flat roasting rack in shallow roasting pan. Spray turkey with cooking spray. Bake turkey 2 hours. Brush turkey with some of the glaze. Loosely cover breast and tops of drumsticks with aluminum foil to prevent overcooking of breast and glaze from darkening too much. 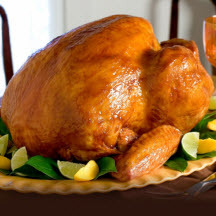 Continue baking turkey 1 to 1 1/2 hours, or until meat thermometer reaches 180°F (82.2°C) when inserted in thickest part of thigh, brushing with additional glaze after 30 minutes. Let turkey stand 15 minutes before carving.